Styling: I really like the look of the Joie Chrome. My husband thinks the chassis looks a bit cheap but I don’t agree. I think every part of the styling has been thought about. There is nothing unnecessary or fussy but everything you need. 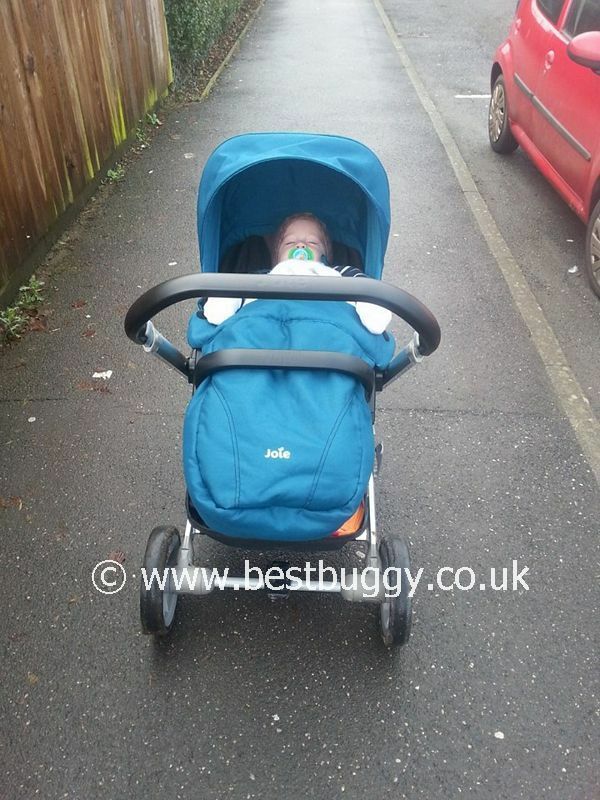 It’s a sleek looking pushchair and I get lots of compliments when I’m out and about. Size: For me, the Joie Chrome is the perfect size. 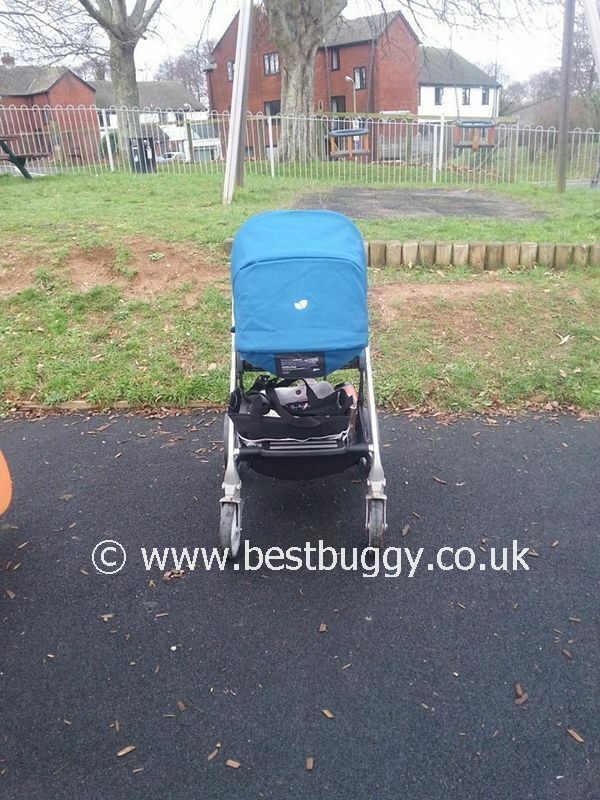 It’s a small travel system or a large buggy. The Chrome fits neatly in buses and round our medieval town with tiny doors and shops. The seat is large enough for my 91st centile almost 3 year old but somehow manages to be cosy enough for my tiny 11 month old. 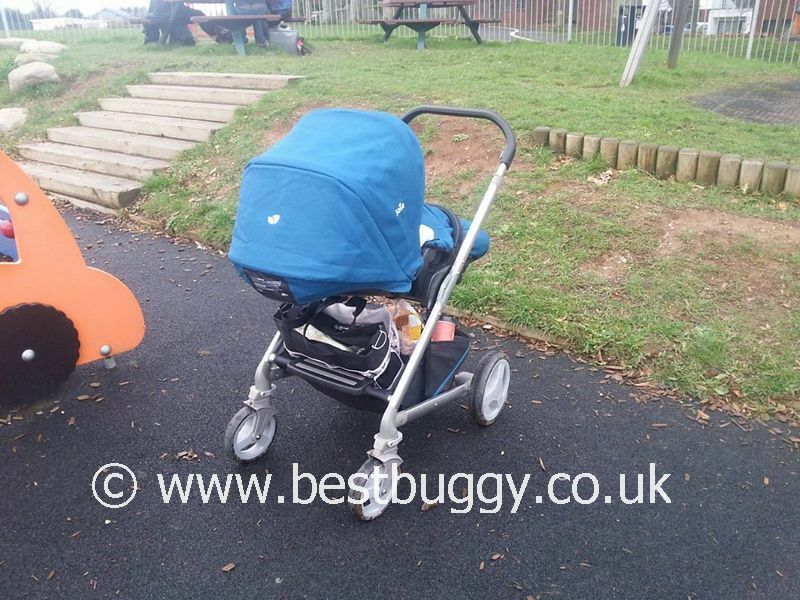 The seat can be parent or forward facing and this doesn’t affect the size, look or fold of the pushchair. Comfort and recline: Both my boys have been happy to ride in the Joie Chrome. My almost 3 year old usually likes to ride parent facing but he finds it more comfortable to ride forward facing in the Chrome as there is no foot rest in the rear facing position. The seat isn’t particularly padded but when I ask the big boy if he is comfy, he always says yes. There are 3 recline positions. Upright, which is very upright, which my boys love. Semi reclined, which is a great chill out position. And flat, which is flat enough for a newborn. The Chrome seat is reclined by a nice sized button on the back of the seat, just under the hood. The button clicks satisfyingly and I can’t see us having any issues with the mechanism. Carrycots and car seats: The Joie Chrome can be bought with the Carrycots and also the Gemm carseat. We only bought the pushchair so I can’t review these. It is worth noting that the pushchair comes with the car seat adaptors and they fit the Maxi Cosi car seats. I don’t know if they would also fit a range of Carrycots as well. Basket: The Chrome’s basket is huge! And you can access it from every side with the seat facing forwards and backwards. I have managed to fit a whole weeks shopping in the basket and hung my bag on the handle. I am seriously impressed with the basket. Raincover: I usually hate raincovers but I don’t have any major gripes so far. It is a shaped cover which covers from the back of the hood all the way to the bottom of the seat. It has two elastic straps on each side which wrap around the handle and Velcro to themselves. I used the cover without the Velcro today and even though it was fine, the straps really keep it taught and in shape. The cover folds pretty small and there is plenty of room for it in the basket. The only thing would improve the cover is a zip around the edge of the hood but that’s just me being fussy. Hood: The hood is large and has a fold out sun visor. I do wish that the Chrome had a zipped hidden extra panel because when the seat is in flat recline, you would need a parasol or muslin to shade baby. When in semi recline or upright, the shade is more than enough. The mechanism on the hood is good and make a good solid click. I have been really impressed by the build quality so far. Handling: I have just moved from a Bugaboo Donkey which pushed like dream so I am comparing the Chrome to that which maybe a bit harsh. I thought that the handling was going to be worse than it is but I have been pleasantly surprised. 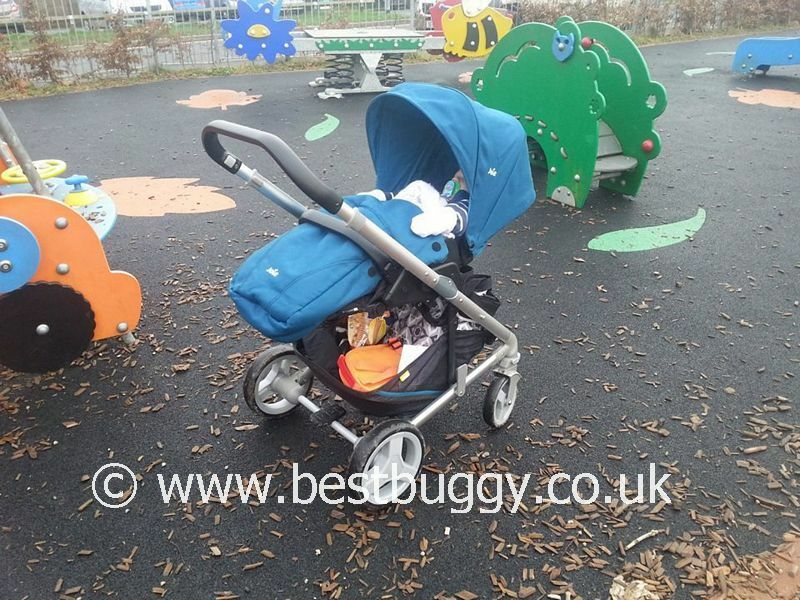 You do have to put some effort into pushing the Chrome unlike the Bugaboo which you only have to think about the direction and it’s already going. I am pleased with the handling. I don’t love it or hate it. It does it’s job without shouting about it. 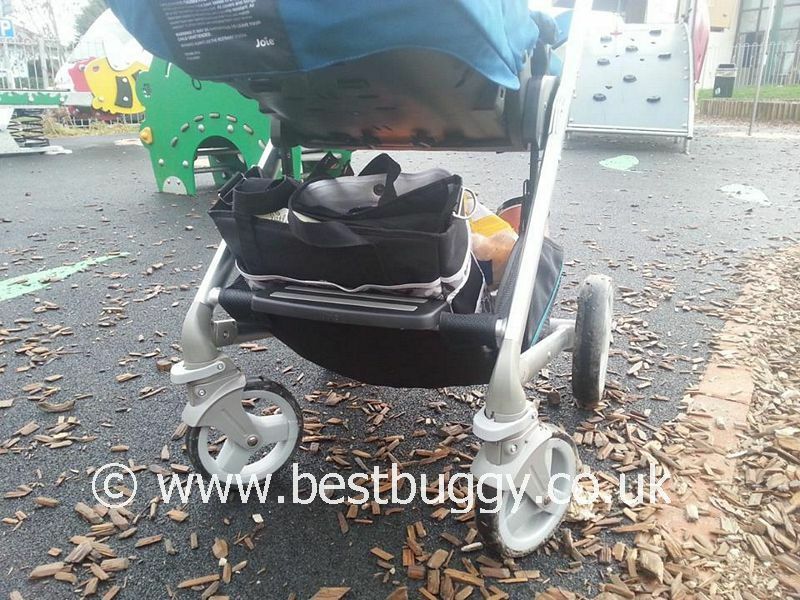 I do find that I have to out my foot on the brake bar to get the pushchair up the kerb due to the chassis shape. That is only an issue when I’ve got the buggy board attached. Brake: The brake lever is in the middle of the bar between the rear wheels. It’s a nice big lever which you push down to put the brakes on and push forward to take the brake off. It is easy to use and you don’t need to scuff your shoes or toes. The only time I’ve had a problem with the brake is when I’ve had the buggy board on as I have to lift the board before I can use the lever. Tyres: The tyres are the only thing that I have been disappointed with. They are pretty hard and there is a slight rattle to them. I would love to see Joie bring out an upgrade option of air or better quality foam wheels. 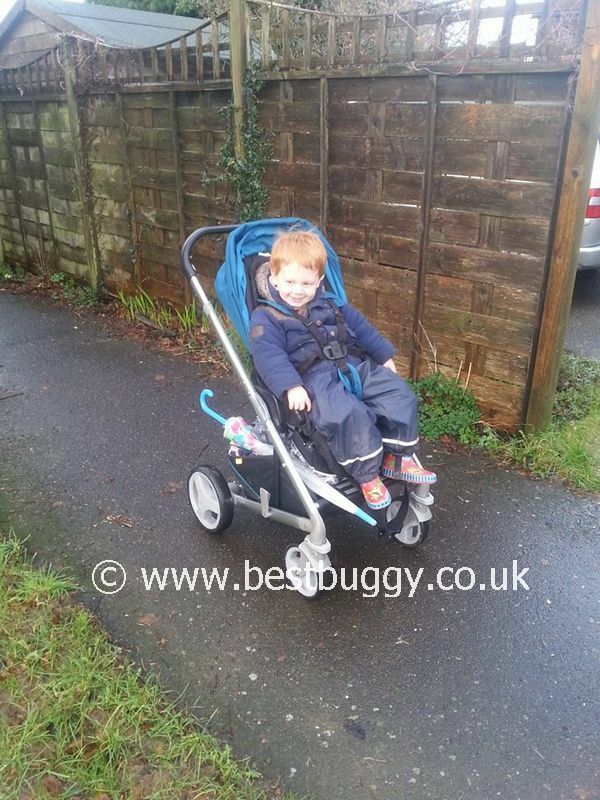 I have used the pushchair on a wheelchair accessible woodland trail and also around town. 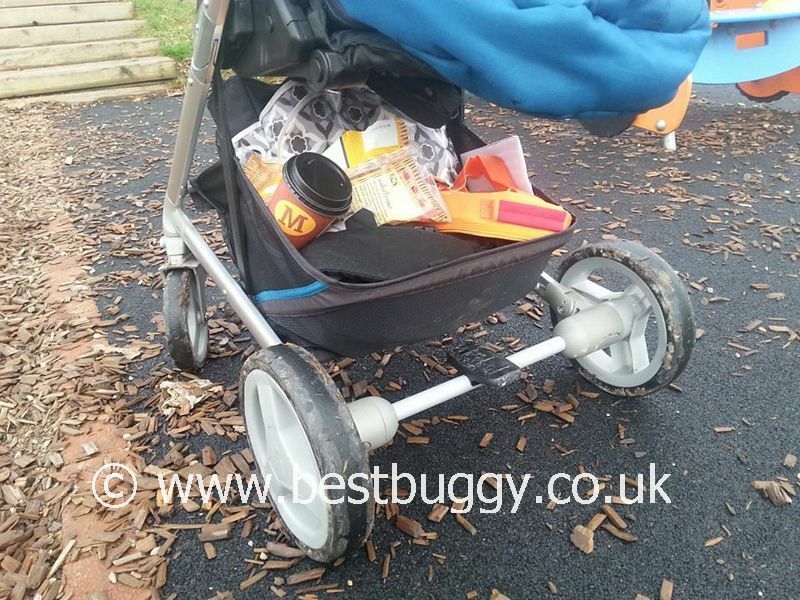 They coped well but I just don’t really like them and think that the whole feel of the pushchair could be improved with better tyres. Fold: The fold is rather fabulous. 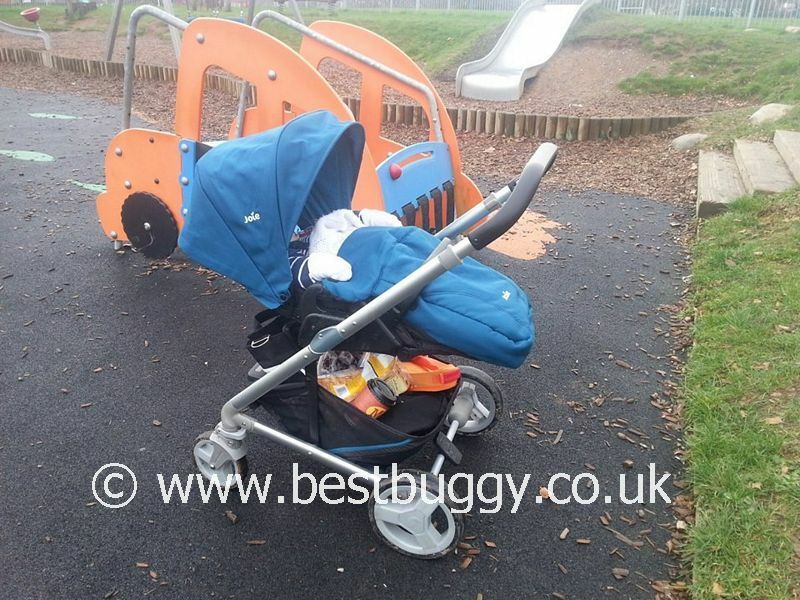 The pushchair chassis folds flat on itself and can be folded with the seat attached and facing either way. To fold with the seat facing forwrd, you fold the back of the seat forward over the base of the seat. You then pull up two small levers on either side of the pushchair. The handle then pushes over the seat towards the front wheels. All done. To fold with the seat rear facing, you lie the seat to the lie flat position and then fold as above. The best bit about the fold is that none of the fabrics or handlebar touches the floor. Only the wheels. 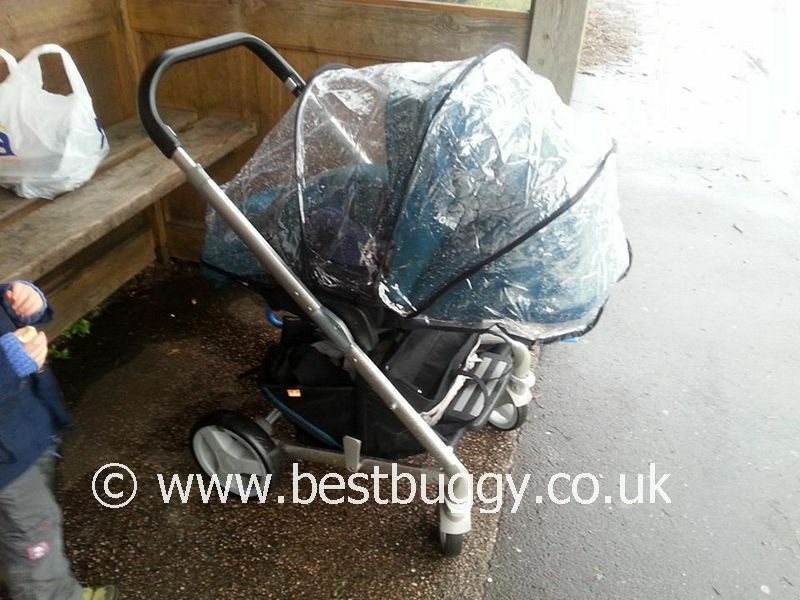 Once the pushchair is folded, you can pull it along like a suitcase. Great for getting on and off the bus. In conclusion: Overall I am really impressed with the Joie Chrome. The product is impressive for the price. I would love to see some upgrade options e.g. better wheels and a hidden panel hood but apart from that I am really happy. I knew that I was going to have to make some sacrifices when I sold the Bugaboo but I really don’t think I have made that many. 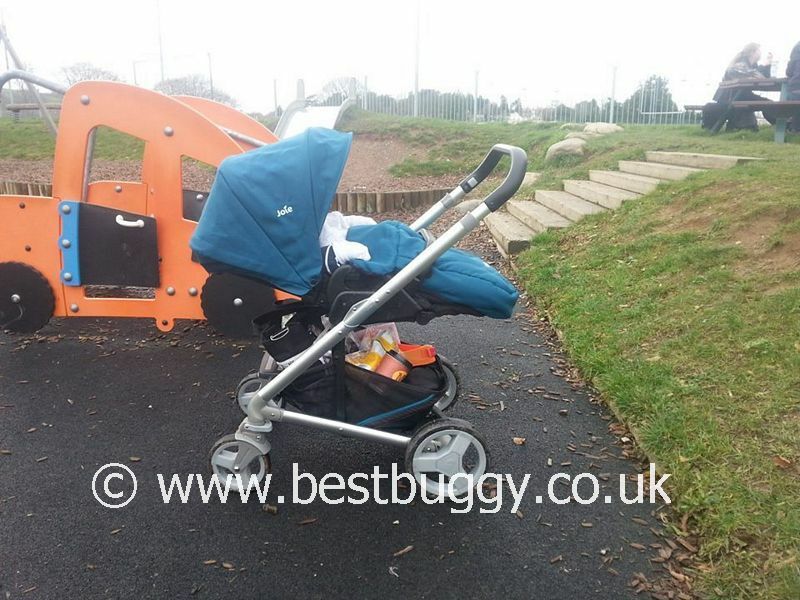 I have to put slightly more effort into pushing it and it is a little more rattly than the Bugaboo but I am impressed with the build quality. The fabrics are on the cheaper side but not horrible. 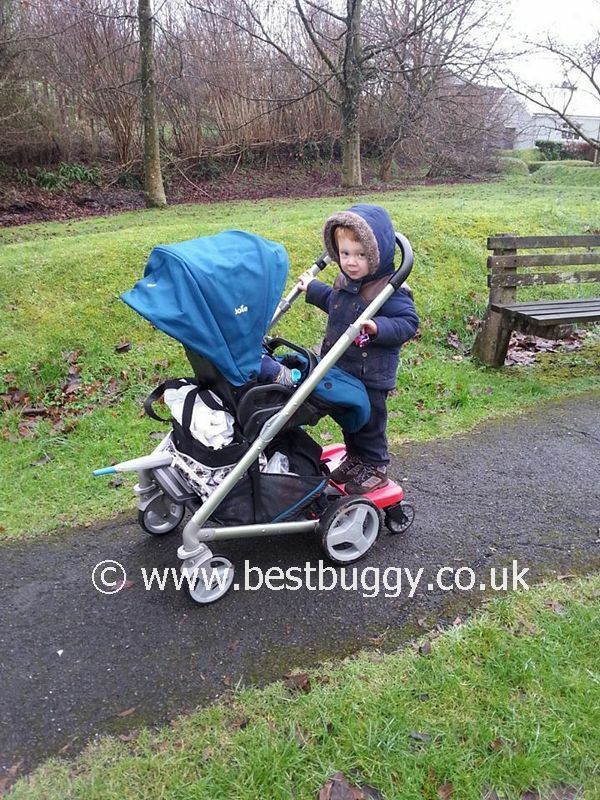 If you are looking for a travel system which is flexible, good looking, small folding then the Joie Chrome is the one. Thank you Jessica for this detailed review.